A soft thud. A muffled squawk. The riffling of frightened feathers. A bird has fallen three storeys down the chimney and cannot get out. Anything that flies terrifies me. I have no idea why. It is something primal, a visceral response I have no control over. The longer I leave the bird in there the more likely I am to panic. I fetch gloves, an old towel. Lifting the cast iron inspection hatch of the old fireplace I feel my way in with one gloved hand. I touch tail feathers. Moving my fingers up the body I feel a backbone, wing joints. Keeping my hand still, I reach in with the other. Then suddenly I grab the bird, afraid it will flutter away, afraid I will injure it. I feel its lightness beneath my hands, feel its bones full of air. I remember the heron skeleton among the reeds on the marshes; each bone like a brittle sponge, full of air pockets, weighing nothing. Now the bird is still. I cannot read it. It’s holding its breath. Perhaps defeated, perhaps waiting for its moment to escape. I bring it into the sunlight, and in a violent rush of energy it pecks me. My hands shake. I hear my heart. I put the bird firmly on the towel beside me and cover it. Wrapping it tight as if it’s a dangerous animal. It cannot escape. It is one of this year’s rooks. Its plumage is not black but the darkest iridescent green or blue depending on how the light catches it. Its adolescent beak not much bigger than a blackbird’s. Rooks are clever birds; although this one, probably due to its youth, was not clever enough not to fall down my chimney. They are not aggressive – I know it will not mean to hurt me. I had a friend at university who kept one in his room, and it seemed utterly benign. But like jackdaws and humans, they are thieves. They will steal twigs from one another’s nests, but never put up much of a fight. There are always other twigs to be had. I like to call the male chivalrous at courting time. After choosing his mate, or reuniting with her from the previous spring, he will follow her around with a small gift in his beak. If she accepts, she is his. And they like to play with the wind. Reminding me of aerobatic pilots in biplanes, they take pleasure is barrel rolls, flicks, tight turns, and dive bombing – pulling up at the last minute and stalling above their nest, tail feathers splayed like air brakes. I wriggle through the broken fence into the wood. It is not my wood, but no one ever goes there except the odd muntjac. It has not been managed for many years. Dead trees have been left where they fell, the coppiced hazel gone wild and spindly. There is much debris underfoot – a soft and nutritious mulch from years of leaf fall. 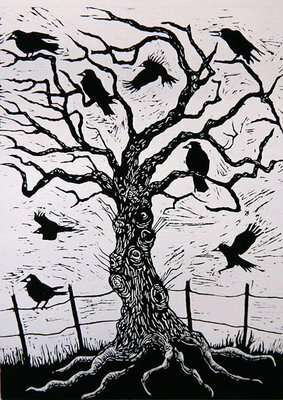 The few dead elms still standing are home to many insects, but the rooks, usually preferring this species to nest in, will not make their homes in the brittle, leafless branches. I head towards the rookery. There are maybe twenty nests. Some say rooks sing, but I would not call this music. They chatter, they squeal, taunt and complain. They remind me of the end of a children’s birthday party when too many games and e-numbers have got the better of them. My rook squirms inside the towel. I hold it tighter and walk into the glade beneath the rookery. All that remains of the bluebells are spiky withered leaves. There is plenty of dog’s mercury and red dead nettle. The birds raise the alarm and cackle, scattering into the sky in all directions as if I were a predator. I unwrap the bird. It seems to be half asleep. Its eyes stare blankly and it doesn’t move. Setting it on the ground, I walk backwards and sit, leaning against a tree. Minutes later the birds return to their nests, making sounds that seem to signal the danger is past. My rook makes a small noise. Like a chirrup, it’s a baby sound. It’s saying, I am back, come and get me. It calls for what seems like a long time. Venus is shining through the thick canopy, and the sky is turning to ink. The youngsters request becomes more insistent. A rook glides silently down and hops from side to side. There is more talk, and the baby half hops, half limps towards it. The adult splays its tail feathers. Something has been decided. There is yet more conversation and the rookery joins in. Then both birds flap noisily, and the adult leads the way back home. The rookery is quieter now. It’s nearly dark, and still they talk. But their sounds are becoming quieter, more hesitant, as if they know the others are trying to sleep. A tawny owl hoots, another replies, and I pick up a stray feather and put it in my pocket. I have to be honest, Derrick. I didn’t. I made it up. Story tellers are consummate liars! But next time it happens (which it surely will), I will do the right thing and you will be proud of me! PS. I do so enjoy your blog! That description of how the bird felt was masterly – not least if it was largely imaginative. I did, there is a gift here for this. Interesting to compare the sensibility with that of Ted Hughes – I don’t often get things with a female sensibility of nature red in tooth and claw – there’s a nice comparison here. It’s an interesting comparison, Geoffrey, and one that may well inspire and offer succour when the well appears to run dry. Thank you. The subject matter is similar, but I like the difference in treatment. Hughes relishes the red and raw aspects of nature, you appreciate it in a different way. Room, of course, for both, but good to have the contrast. A wonderfully descriptive piece of prose, Rachael. You have captured the scene perfectly, allowing the reader to visualise themselves in this situation. What I like most, perhaps, is the way that this whole story could be seen as a metaphor for finding oneself. I really enjoyed reading this. Such positive comments make my day. Thanks, Chris. I didn’t intend the metaphor – in fact I rarely think deeply about anything I write, but I suppose I can leave that to the sensitive reader! I think that sometimes our sub-conscious takes over and it’s only later that we realise what it is that we have created! I really enjoy your prose Rachael. That’s compliment enough for me, Dan. Thank you. Your writing gets better and better. You have quite a following now. You are currently reading rook at Changing Skin and other stories.